Welcome to the Home of Chicken Cracklings! Sure, you all know what Pork Skins & Pork Cracklings taste like, but you have no idea what you've been missing until you've tasted our Kim's Country Fried Chicken Cracklings. 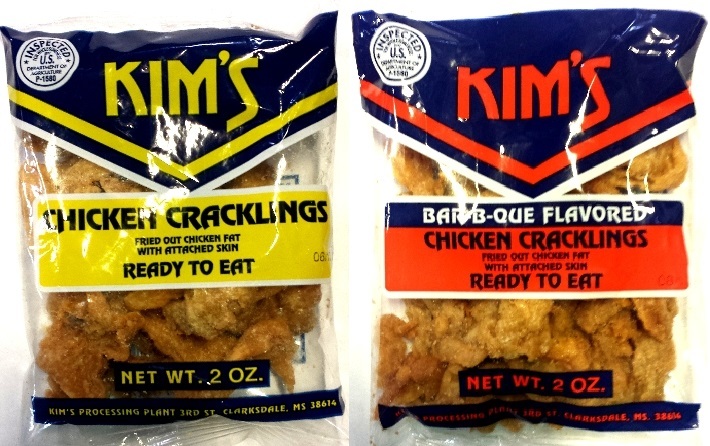 We are local distributors for Kim's in the Memphis,Tn. area and are happy to ship to you anywhere in the U.S.
Our chicken cracklings are fried-out chicken fat with attached skin.They come in 2 oz. bags, and you can choose either Regular or our famous BBQ flavor.There are 36 bags per case (best deal). You may order as few as 18 bags (mix or match). Please use the drop down menu above to enter your preferred choice of flavors and quantities. *Note: All of our chicken products are cooked only in its own fat (no pork). * Please allow 10-21 days According to your State. ** We want to assure you get the Freshest Product. or mail check to American Wholesale Dist. * Note: If no answer or voicemail is full, please send text message. Occasionally we get swamped with orders but rest assured you will receive fresh product. Be Sure to Check Out our Other Products Page Occasionally as we Add Other Popular Items ! Now accepting Bitcoin and Litecoin as payment. Text 901-258-2945 for info.